My BFF and reality show contestant Rachel Coleman won the title of America's Best Worst Cook. She beat out a large field of other bad cooks and legitimately impressed a panel of professional food critics to earn her spot in reality TV history. Rachel was the first new friend I ever made in NYC, which was a pretty big deal. You should all pay her blog a visit at popjew.blogspot.com. 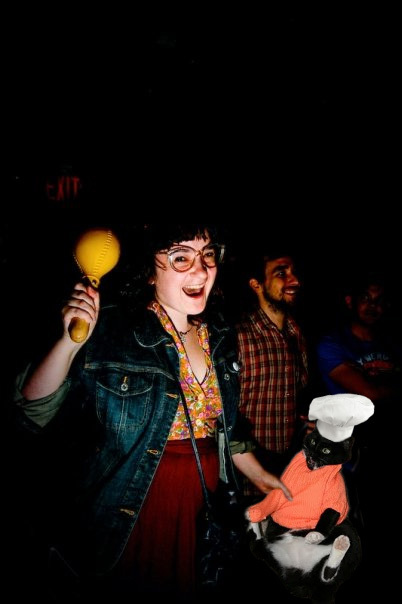 She knows all about cool Brooklyn music which should be pretty obvious from this awesome picture of her with a maraca - everyone loves to make music, even if it's shaking one of those rattly things while you're reading this and playing around on www.partypoker.com;, surely. If you do check it out be sure to leave her a comment and congratulate her and urge her to not forget her friends now that she's super famous. Quality posts is the main to interest the people to go to see the site, that’s what this site is providing.